I am a serial putterer. On Sunday nights I like to wander around the house, watering plants and moving things around. I bought this Valentine plant basket for half-price at the grocery. It came in a garish pink and red basket. 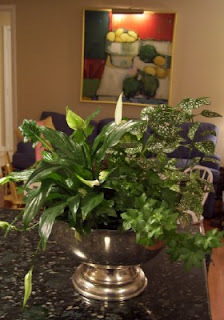 I removed the plants--still in the original clear liner--and popped the whole thing my yard-sale punch bowl. I love it! One big grouping always makes more impact than several small things. Just beautiful! And I love your countertops! Very elegant Meredith. And if you're lucky those plants will live long and grow large--7 years later I still have most of the plants from a similar arrangement my husband gave me our first married Valentine's Day. One (an umbrella plant) grew to five feet tall before I planted it outside! The first year they just lived in their original container (a very pretty metal scrollwork box lined with plastic) with no special attention.